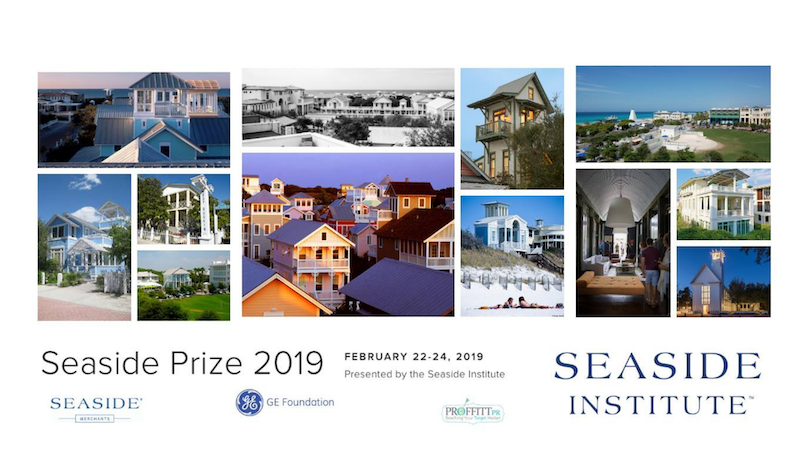 SEASIDE, Fla. (February 13, 2019) – The Seaside Institute™will hold the 27thAnnual Seaside Prize™ Weekend on February 22-24, highlighting 2019’s award recipients and the significant contributions they have made to enhance the community.Along with the main awards ceremony on Saturday evening, the Seaside Institute™ will be hosting a series of events throughout the weekend for members and ticket holders to attend. The Seaside Institute™ awards the Seaside Prize™ each year to individuals or organizations who have made significant contributions to the quality and character of the community. The recipients of the Prize have a major influence on how towns and cities can best be built and re-built to reflect and promote walkability, diversity, beauty, and sustainability. Seaside Prize winners are leaders of urban design, planning, architecture, development, and education. The Seaside Prize™ Weekend will begin on Friday, February 22, at 5 p.m. with a Welcome Reception in the Academic Village Courtyard. Attendees will proceed into the Assembly Hall for the Key Note Presentation with former Seaside Prize™ Winner, Scott Merrill. Those registered for the event are invited to end the night at 45 Central for a reception featuring a paella dinner and book signing beginning at 6:30 p.m. The Seaside Institute™ will continue their celebratory weekend with various lectures from the Seaside Prize™ Winners. These lectures will be open to registered event attendees and held in the Seaside Assembly Hall from 9 a.m. until 4 p.m. Before the awards ceremony, there will be a Seaside Institute™ members-only party at the Reverie Cottage in Ruskin Park from 4- 6 p.m. Members are invited to enjoy appetizers, beverages and sunset rooftop views with Seaside’s finest. The night will conclude with the Seaside Prize™ Awards Ceremony at 6:30 p.m. in the Seaside Chapel followed by a reception dinner at the Seaside Lyceum Stage. The weekend festivities will culminate with an Urbanism Tour led by Seaside Prize™ winner, John Massengale. Those registered for the event are then invited to Bud & Alley’s for a final brunch 11 a.m. to top off the weekend. If you are interested in attending any of the events of the Seaside Prize™ weekend, visit http://bit.ly/SeasidePrizeTickets for tickets and information. To become a member of the Seaside Institute™, visit http://bit.ly/SeasideJoin.